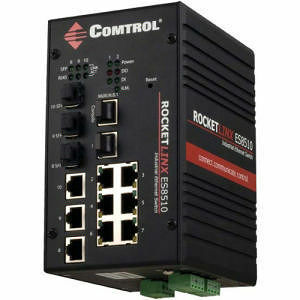 The RocketLinx ES8510-XTE is a managed Industrial Ethernet Switch, equipped with seven 10/100Base-TX ports and three RJ45/SFP combo (10/100Base-TX, 100Base-FX) ports. The 3 combo ports offer flexibility for additional fiber connections by plugging in different types of SFP modules, which can support distances of 2KM in Multi-Mode or 120KM in Single- Mode. The combo ports make port combination even easier, such as 8 RJ ports and 2 fiber ports, or 9 RJ ports and 1 fiber port.